Other Products: White Cardstock, Corner Rounder, Ribbon, Memento Dandelion ink. For more tips on creating with the Singing in the Rain collection, watch the tutorial at https://youtu.be/_J85LChrXSs. Instructions: Begin making your tag by cutting a piece of White Cardstock 8 x 3 3/4", layer it with a piece of the Singing in the Rain paper cut 1/4 inch smaller after rounding the 2 top corners. Using the Words of Encouragement Stamp, stamp at the top of the tag with the black ink. Make a bow and adhere to the top of the tag. Stamp the leaves on white with Bamboo Leaves and lightly color them in with the same ink. 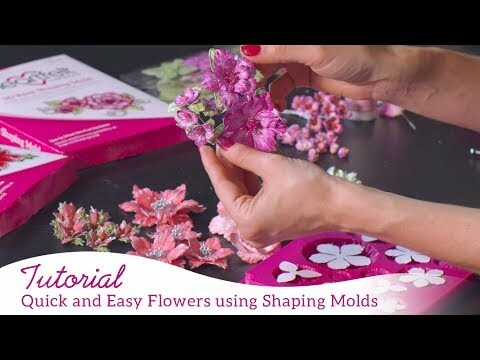 Cut out using the coordinating die and place in the Flower Shaping Mold. Stamp the flowers on white with Color Box Chambray, color the centers with the Memento Dandelion and the edges with more of the Chambray. Cut out, place in the Flower Shaping mold, run through the machine, place 2 together and glue in place with dries clear adhesive on the tag. To finish the tag, using dries clear adhesive, add Crystal Clear to the birds, leaves and flowers. Add Prills to the center of each flower.